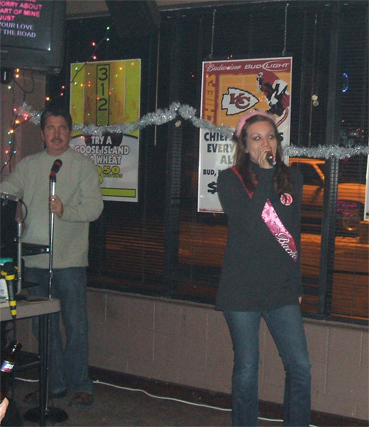 Saturday 12-29-07 - Jessica Harp singing Leave The Pieces at her Bachelorette Party at Stables Grill and Bar in Kearney, MO. Jessica also disclosed that "The Wreckers Are No Longer Together (Publicly for the 1st time)." Jessica posing below the Stables neon sign. Jessica was amazed by the quality of all the Karaoke singers and by the largrest karaoke library of The Wreckers she knew existed! 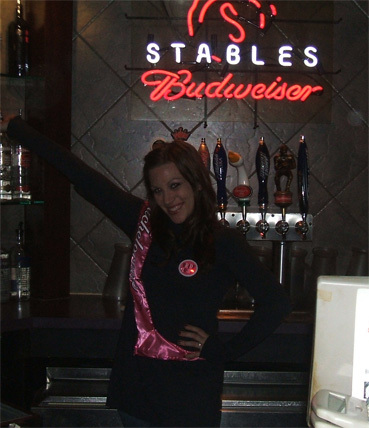 Thanks Jessica for choosing Stables Grill and Bar for your Bachelorette Party! Contact us using the form on the Right hand side of the page and we will be more than happy to discuss how we can help make your Bachelorette Party a success and an event that will be talked about for years.